← Do you keep a diary or journal? What if someone read it? Charmouth beach is probably one of my most favourite spots along the Jurassic coast; since benefiting from the natural tidal migration of the imported sand the council deposited on Lyme Regis beach, Charmouth now has the perfect mix of large sandy areas that are so much kinder to your bare feet, the clearest of seas that is simply teaming with aquatic life, rock pools when the tide is out and of course the incredible treasure chest of fossils. And whilst it is fair to say I enjoy it most during warmer days, there is something equally appealing about it during the winter months when the picnics, parasols and paraphernalia of paddling people are replaced with suited and booted walkers there to enjoy the thrill of a rough sea, the bracing fresh sea air and the unique sound of the waves as they tumble into shore. Of course these past few weeks have witnessed quite extraordinary scenes of devastation as the world’s climate accommodates the incessant and indifferent behaviour of its offspring. But as with all parental responsibility, having allowed us to continue and carry on regardless, we are now being shown just what happens when we don’t take heed. We are reminded just who is boss. 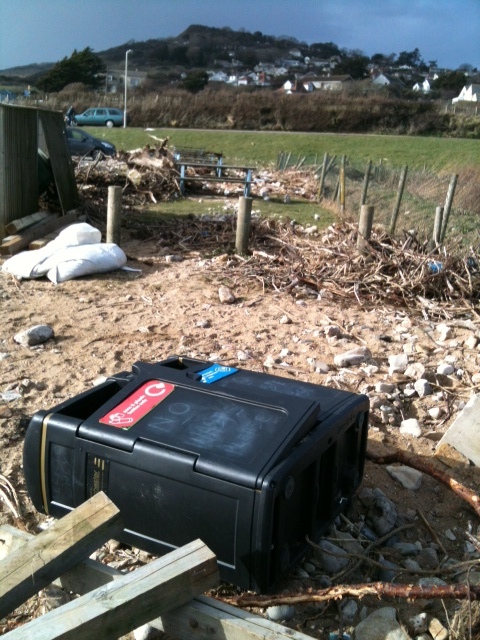 A recent trip to Charmouth left me in no doubt she meant business! 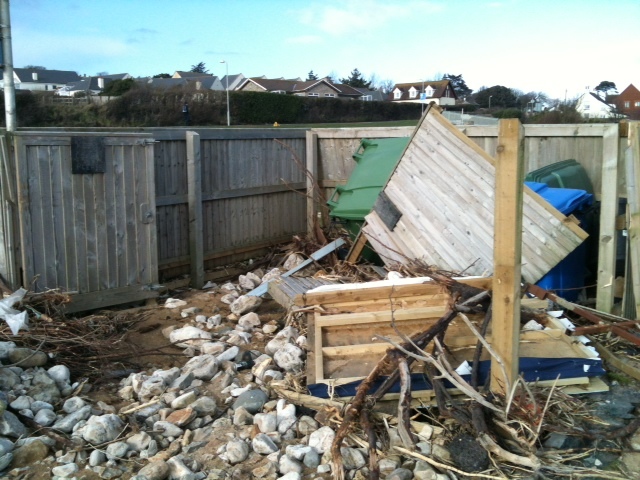 It was only when I noticed where the ticket machine was for the car-park that I appreciated just what the sea and storms had been up to. 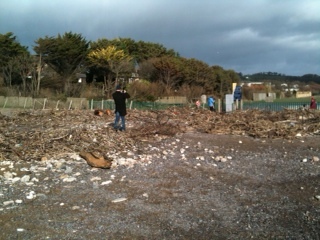 The entire bottom section of the parking area was strewn with huge piles of branches, crab & lobster pots, trees and other more human related rubbish. So not only had the storms ripped the trees and bushes out by their roots, they had dragged them out to sea then in a final fit of pique, hurled them back on shore when the mountainous seas surged inland. It looked like a battleground after a particularly unpleasant skirmish. 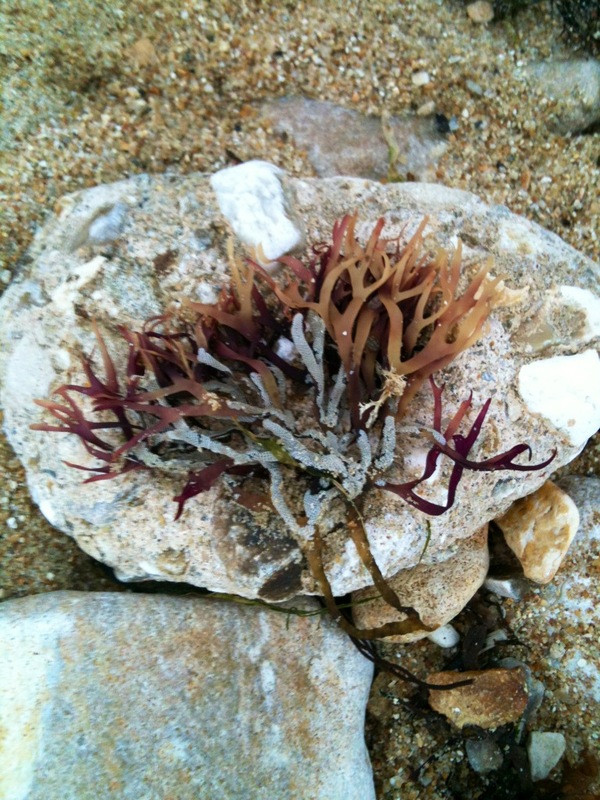 It was fascinating to see that instead of the usual fossil foraging that takes place (especially since the incredible Ichthyosaur fossil was found on Boxing Day) http://www.bbc.co.uk/news/uk-england-dorset-25578510 there was rummaging of a very different sort that was just as keen. 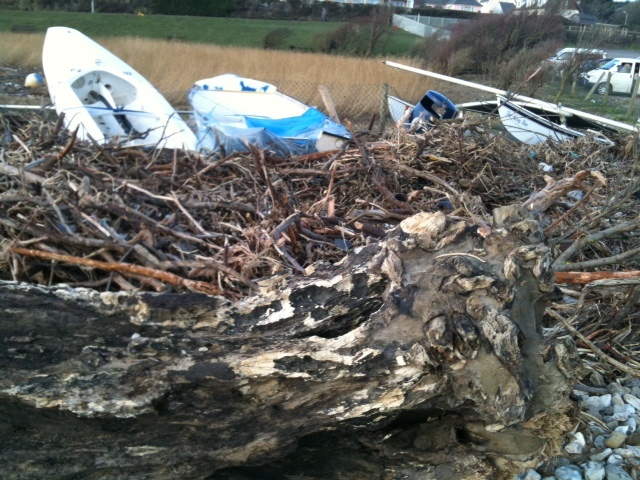 That of driftwood collecting. Whether it was for the wood burner (of which there are many in this part of the country) or to sculpt into some artistic form (of which there are similarly many in this part of the country), there were rich pickings to be found and in the unlikely event that the local council will have the time to sort it out, it seemed an almost public duty to remove as much as you could. Sadly, as with any battle, there have been casualties. Among the bonfire high piles of sticks and branches lie the stricken bodies of someone’s pride and joy in the form of small dinghies that have been pushed and shoved and cast aside as the waves chucked whatever they could carry at their hapless hulls, their owners too fraught with the danger of trying to rescue them before it was too late. 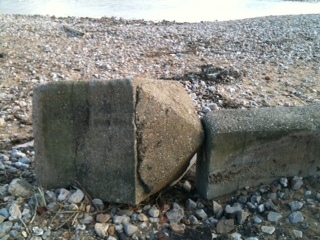 A scene that I thought was particuarly telling was the World War II concrete defence pillar that has stood resolutely for over 70 years surviving the German bombardment and acting as the first line of defence should our enemies try to conquer our little island. It now lay prostrate amongst the stones, too heavy to shift (which is just as well as it would probably have caused a level of damage similar to a bomb going off had it been launched skywards) it had been toppled from its post and was languishing in a comatose state of resigned submission to something far greater than the German Luftwaffe. The black humour of Mother Nature continued to express itself with the undamaged door to the wheelie bin shelter that has ‘Please Close Door’ still legible on a notice nailed to the door; two sides and the roof of the structure being elsewhere. The picnic benches, secured with bolts that I imagine had been done with the aim of preventing visiting thugs from tossing it about, had managed to hold fast and sat determinedly awaiting their seasonal guests. As we walked along the shore, the high tide approaching, the southerly wind was giving the sea an extra boost and there were regular powerful waves that rushed up onto the beach further than you might expect, some of them hitting the now extended cliff edge (the ‘natural erosion’ resulting in a narrower stretch of beach between cliff face and sea). I couldn’t help but wonder at the common sense of a young family I could see continuing to walk along the beach oblivious to their possible fate – it would be a slow demise by either drowning or descending into the mudflats & sinking sand that formed a deadly platform between the disintegrating vertical cliff face and the beach. Sadly it’s not just their own lives they put at risk, but the brave people who have to rescue them. We didn’t hang around long enough to see the outcome of their folly as my sons had reached the second stage of hunger i.e. “I’m absolutely starving I haven’t eaten for more than an hour”. So we made our way back over the battle weary grounds of the car-park to the safety of our car and just in time as a violent hail storm rained down on us, millions of tiny piercing ice balls peppered the whole area, they rattled and tapped on the roof and windscreen of the car, bounced off hard surfaces and briefly turned the road white and icy. 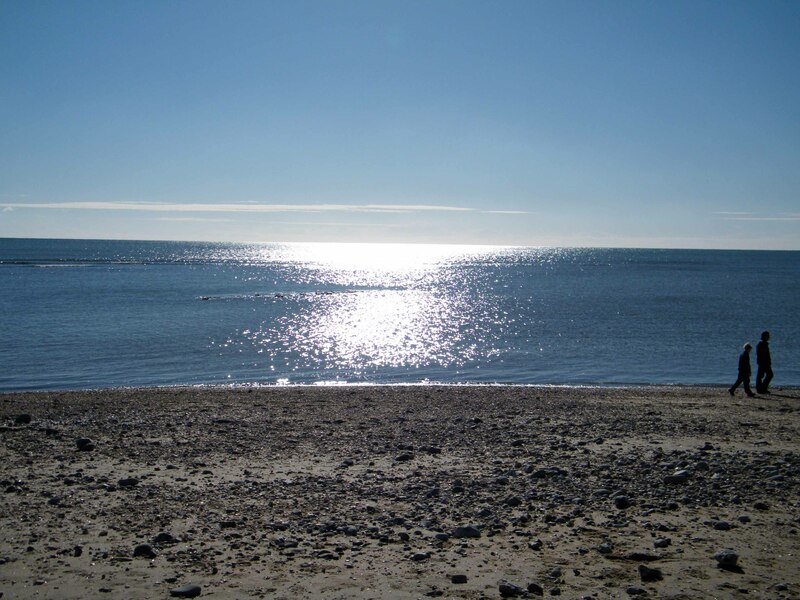 We were glad to have escaped that attack and I wondered lamely if the family I had seen heading further along the beach had managed to escape the incoming tide, the mudflats & sinking sand and finally the sharp ice stones from the heavens’ icy scatter gun. So in her cruel to be kind skill of parenting, Mother Nature is giving us our final warning before we are grounded for good. 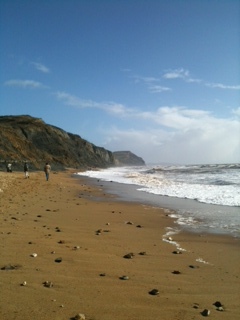 This entry was posted in Life's Like That and tagged beach, Charmouth, Jurassic, sea, storms. Bookmark the permalink.